Please provide links, if available, to your competitors. Please view the right side of this page for definitions & examples of the above three styles. 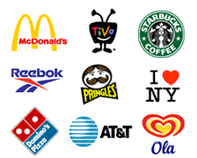 Please browse the web to show us which logos appeal to you & why. They don't have to be related to your industry, this is to get an idea of what style you would like. Also feel free to send me logos you dislike & why. The more examples you show, the quicker the process will be. Please provide any additional information / reference URL of concepts that you think will be useful for the designer. Example: business cards, envelopes, letterheads, website, etc. 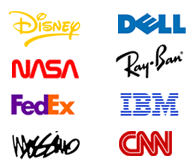 A logo is a perspicuous glyph or symbolic, identifying mark that conveys origin, identity, or ownership. The main function is to elicit recognition. 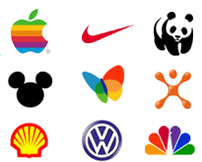 The object of a logo is to act as a mnemonic device and identifier, to communicate a desired thought or feeling, and to generate a desired emotional response. A thought-provoking logo design can strengthen your brand image and corporate identity, giving you a psychological advantage over your competition. Your logo is the core of your corporate identity, defining and symbolizing the character of your company or organization. Clarity when reproduced in small sizes. Can be illustrative in nature, either concrete or abstract. Logotype/Wordmark - A logotype, commonly known in the design industry as a "word mark", incorporates your company or brand name into a uniquely styled type font treatment. Type fonts come in thousands of possible variations, shapes, sizes, and styles, each conveying a slightly different impression upon your intended audience. Script fonts imply a sense of formality and refinement. Thick fonts proclaim strength and power, whereas slanted type fonts impart a sense of motion or movement. Type font treatments can also include hand-drawn letters, characters or symbols that have been rendered in such a way as to intrigue the eye and capture the interest. Images can also be integrated into a logotype, often to great visual effect. Of prime consideration when selecting a logotype or wordmark is legibility and ease of recognition, even when reduced to the size required for printing your business cards. Combination Marks - Combination Marks are graphics with both text and a symbol/icon that signifies the brand image that you wish to project for your company or organization. Concise text can complement an icon or symbol, providing supplemental clarity as to what your enterprise is all about. There are integrated and stand alone combination marks. For instance, Starbucks logo has the text with the graphic integrated, whereas the AT&T logo has the icon separate from the text.